Regulatory filings: FDA¹ and EMA² guidelines require specific binding site information to be included in regulatory dossiers for novel antibodies. 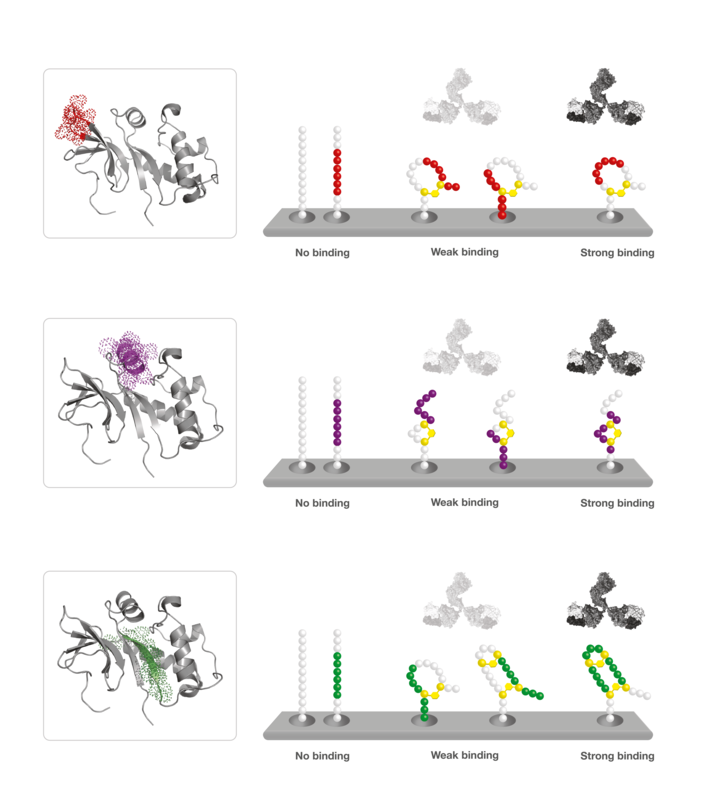 The surface of a protein interacting with an antibody is not always a simple string of amino acids, but often consists of a complex of loops and folds determined by the interaction between side chains of the residues. Linear epitopes: defined by the primary amino acid sequence of a particular region of a protein. The epitope can usually be mimicked with linear peptides. Conformational epitopes: defined not only by a primary amino acid sequence, but also by its spatial conformation. Appropriate epitope mimicry usually requires constrained peptides. 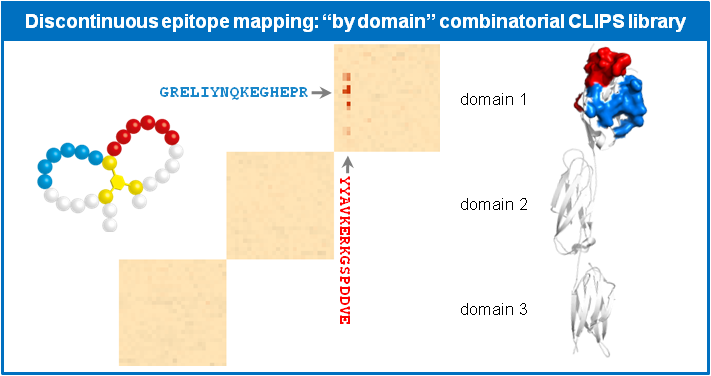 Discontinuous epitopes: the epitope consists of non-adjacent parts of the protein sequence, which are brought together in 3D structure by constraints. The vast majority of therapeutic antibodies have a conformational or discontinuous epitope. Therefore Pepscan, as the inventor of epitope mapping with linear peptides, perfected its technology through the addition of CLIPS technology to enable addressing the 3D spatial conformation of epitopes. This has resulted in CLIPS Precision Epitope Mapping, a unique, high resolution mapping technology using 3D-structured peptides to characterize discontinuous and conformational epitopes with high accuracy. Many leading companies, therefore, apply our Precision Epitope Mapping to their promising therapeutic antibodies, several of which received FDA breakthrough status or accelerated approval, such as daratumumab (JNJ), ofatumumab (GSK/Novartis) and obinutuzumab (Roche). Including PTM’s, cyclizations, helices, β-sheets, etc. CLIPS Precision Epitope Mapping uses arrays with large, surface-immobilized libraries of conformationally CLIPS-constrained peptides derived from the target protein. The binding of the antibody to each peptide construct of the entire library is determined. This affinity information is used in iterative screens to define the sequence and conformation of epitopes in detail. For more details see the Technology section. Pepscan’s Precision Epitope Mapping offers a comprehensive epitope mapping services package, addressing all needs occurring in antibody characterization or vaccine development. Work with the experts in a project that is tailored to your needs! Anti SIRPα is a monoclonal antibody that specifically recognizes human Signal Regulatory Protein Alpha (SIRPα) and has poor or no cross-reactivity with variants of human SIRPβ. SIRPα is a regulatory membrane glycoprotein from SIRP family expressed mainly by myeloid cells and also by stem cells or neurons. SIRP α acts as inhibitory receptor and interacts with a broadly expressed transmembrane protein CD47. Because the epitope of the anti-SIRPα antibody could not be mapped with linear peptides, Pepscan applied CLIPS 3D Structured Epitope Mapping. Based on a matrix design, a comprehensive library of combinatorial peptides based on the sequence of SIRPα by introducing structural constraints in arrayed peptides was synthesized. Heatmap analyses showed that only peptide chimeras containing both peptide stretches YYAVKERKGSPDDVE and GRELIYNQKEGHEPR strongly bind to the anti-SIRPα antibody and thus represent the core epitope (Figure). Linear peptides or simple looped peptides are not bound by anti-SIRPα antibody (data not shown). Identification of the discontinuous epitope for anti-SIRPα using double looped matrix CLIPS peptides derived from the sequences of each individual domain of human SIRPα (2wng.pdb). Individual domains are correspondingly labeled. Only mimics containing residues YYAVKERKGSPDDVE (red) and GRELIYNQKEGHEPR (blue) located within the first lg-domain were bound by mAb4546. On the right is the vizualization of the identified stretches onto 3D structure of SIRPα, where the partial epitope candidates are colored respectively. Other illustrative case examples, such as the elucidation of the discontinuous epitope of daratumumab (Darzalex, JNJ) or the helical (conformational) epitope mapping of a Flu virus antibody can be found in the case example section.